It is said history does not repeat itself but it does rhyme. The characters of one period to the next change, as do the details but the actions, circumstances and scenes often mimic each other. To that end, the present situation in the Ukraine is a familiar one with characters that bear a striking resemblance to those of days past and that paints a picture in eerily familiar shades. In September 1938 Germany annexed the Czechoslovakian Sudetenland under the pretense of protecting ethnic Germans after strife in Czechoslovakia erupted. It is worthy to note that this action was taken after the European powers muted response to Germany’s takeover of Austria. In a near repeat, Russia has invaded the Ukraine under the pretense of protecting Russians in Crimea. An action that follows earlier use of the Russian military in Georgia that was met with only fainthearted protest from both Europe and the U.S. Unfortunately for the world the similarities do not end there. 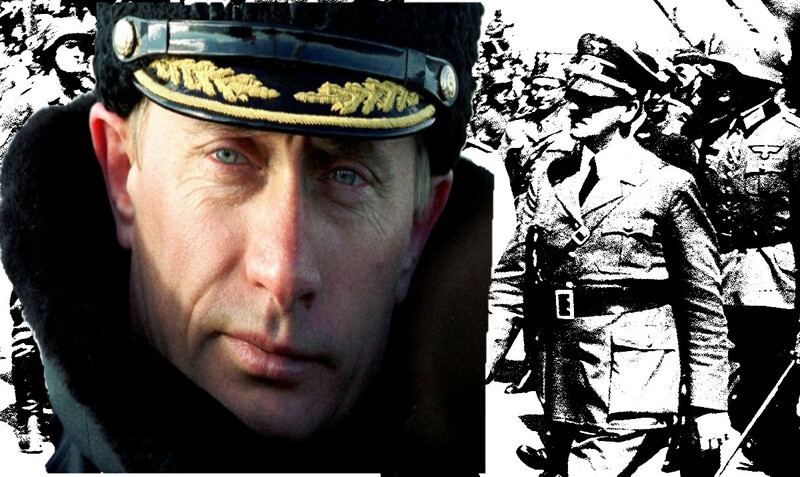 Like Hitler, Putin wants to reconstitute the Russian Empire and annex the lands of all ethnically related peoples. In Russia, like in Germany, the leadership has tried to cultivate a cult of personality around its leader even to the extent of promoting a Hitler-esque Putin youth movement. Finally, Putin like Hitler has recruited a cabal of evil to assist him in fending off the west. In this cheap remake of the original China it seems is to play the role of Japan and Iran/Syria are to be his Italian lap dogs. Despite the similarities, the present situation is not yet a repeat of the past. It may or may not evolve into a cheap B movie remake of an original, but the scent of war with a nuclear twist is enough to make anyone stand up and take notice. This is especially true when dealing with deluded despots with dreams of grandeur. Dealing with tyrants is not for the timid; history shows that capitulation to them is the fodder of fools. Like the poor child who gives up his lunch money to a school yard bully, giving in to oppressors and war mongers only encourages them to continue on their path. This is a lesson seemingly lost on Western leaders on both sides of the Atlantic. Early on in his Administration, President Obama betrayed Poland and the Czech Republic to gain favor with Putin; something he did not bother to get even a hint of concessions for in return. The Europeans, similarly, have repeatedly given in to Russian blackmail over fuel. The open mike comment by President Obama that he would be even more flexible after his election shows he had no intention of moving away from his policy of appeasement. Add to this, the President’s virtual surrender to Iran over its nuclear program and the pattern has been set. A pattern that has proved to Putin and his allies they have nothing to fear from the west. In light of what is happening the Obama administration’s announcement to scrap much of the United States military now looks especially naive. The collapse of the U.S. military could plunge the world into a new dark age. Not just Russia and China, but a whole cadre of evil is waiting in the wings to envelop the world. Islamist, Latin American despots, African warlords and even pirates, all leap at the idea of a diminished U.S. presence. Even now forces are lined up and the stage is set for them to initiate a cycle of hellish wars with only the United States standing in their way. One thing is certain, if the path laid out in September 1938 is to be not walked down again the same mistakes must be avoided. In the face of such overt threats as those posed by Putin and his associates, only strength has a chance of maintaining the peace; the question is, if not the U.S.’s than whose?